Greater control over fuel delivery and spark advance adjustment. For select single and twin cylinder engines, fuel delivery and spark advance adjustments can now be made with the NEW Dynatek Fusion EFI with Fuel and Ignition Controller. 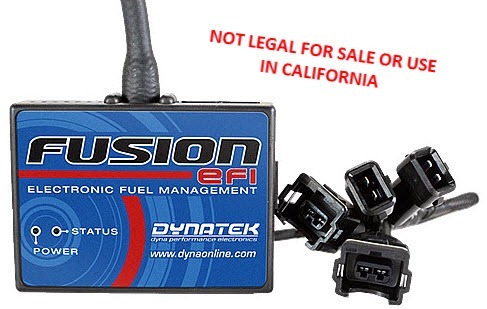 You may notice Dynatek’s Fusion EFI with Fuel and Ignition control resembles the industry standard Dynojet Power Commander PCV. The Fusion EFI does share many of the same features and accessories and is a cost effective alternative. All Fusion EFI use RPM and throttle position inputs (some models feature additional inputs like cylinder head temp, water temp, gear position or boost) to base air/fuel curve adjustments with easy to use software. The Fusion EFI offers a number of options for tuning from bike-specific dyno tuning, to the optional Dynatune accessory module or from a wide range of maps that can be shared from the PCV database. For fine tuning the Fusion EFI maps have 250 rpm resolution and 10 throttle position columns with up to 640 individual mapping points for fuel and ignition timing. The Fusion EFI is effective at improving throttle response, reducing flat spots, surging rpm conditions and efficiency for stock and/or modified applications. Another feature of the Fusion EFI with Fuel and Ignition is the ability to use any TWO of these functions at the same time: Map Switch, Pit Lane Speed Limiter, and Launch Control.